There's no need to be tethered to your desk with this stylish tablet arm chair from OFM. The ORO100 features a tablet arm for your iPad, laptop, etc. that can pull up and swing away when not needed. The tablet's position can be adjusted, and it features a non slip surface and a shelf edge to keep your electronics from sliding off. The tablet size is 14"W x 9.50"D.
The chair features an adjustable height headrest as well as adjustable body bolsters for comfort. 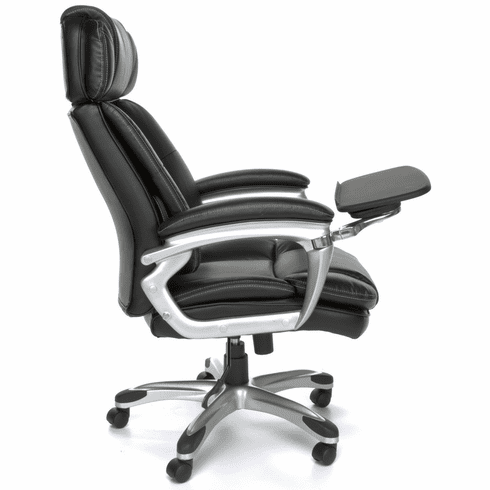 The perforated black bonded leather is soft and supple and features contrasting double stitched seams. The arms are also padded for comfort. The ORO100 is also Greenguard certified, has a 350 lb. weight capacity and comes with an attractive 27" base with dual wheel casters. Limited lifetime warranty from OFM. Dimensions: Seat Size: 21.50"W x 23.50"D. Back Size: 20"W x 28"- 31"H. Seat Height: 19.50" - 22.50"H. Overall Height: 45.50" - 51.50"H. Meets or exceeds ANSI/BIFMA safety standards. The ORO100 ships out in 1-2 business days from NC.